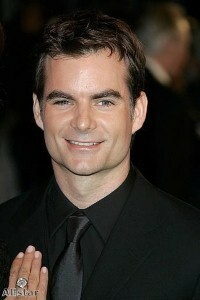 NASCAR racing star Jeff Gordon may be able to handle a tight turn in a sports car at high speeds, but he’s a little unsure how he’s going to handle his daughter’s changing behavior. "I am still awaiting her terrible twos behavior," Gordon told People magazine. "When it is time to eat, time to nap, or time to stop playing, we have to nudge her a little harder but she is such a doll, I can’t really call it a major change in behavior." The racer’s 2-year-old daughter Ella Sofia recently celebrated a birthday in June with her father and model-actress mom Ingrid Vandebosch. Gordon also revealed to the news provider that his daughter cheers him on as he races around the track and excitedly says "Go papa go!" when the 38-year-old whizzes by as she sits in the stands. As for fatherhood, it appears to be suiting Gordon, especially when he calls his daughter a miracle. "Ella is a miracle and has changed my life," Gordon said. "I love doing things with her. When I wake up in the morning and experience her energy, she lights up the room, and I lose sight of everything else in my life."